Jack Black has long been channelling his inner rock god as one half of Tenacious D, and he brought that to a mainstream stage with the 2003 hit movie School of Rock. It turns out that one of the kids who starred in the film followed in Black's footsteps and started a band of his own — and Black seems to be a fan. Kevin Clark played the schoolboy drummer Freddy Jones in the film, and 15 years later, he's the drummer in a band called Dreadwolf. 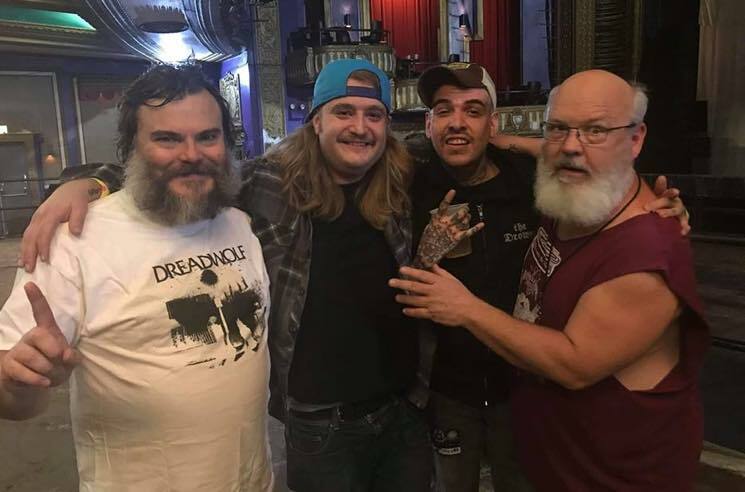 Earlier this week, Clark went to see Tenacious D in Chicago, and when the pair met up backstage, Black was rocking a Dreadwolf tee. Clark shared a photo of the reunion via the band's Instagram. Check it out below. Tenacious D released their latest album Post-Apocalypto earlier this year. They'll be coming through Calgary, Edmonton and Vancouver next month on tour, and you can see the full list of shows here. Dreadwolf, meanwhile, are planning to release an EP on January 1.